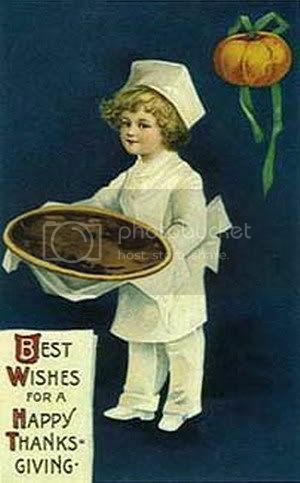 A happy holiday to you who celebrate it, and a beautiful week and weekend to those of you who don’t! ~ The Council of Elrond screencap posts are still not quite ready, but I hope to have the series up by the weekend. ~ No snow yet. Here’s a shot of young deer in our snowless backyard on Friday. I ran out to take their picture while they were gleaning fallen crab apples. One of them has heard me trying to sneak closer. You can't mean the boy with the pumpkin, Cat, so I am thinking you mean young deer in the backyard. Yes, it was very neat. There are often deer in the yards or walking down the street; the city is considered overrun. But on this day I saw four out there in swift succession. My window next to this computer looks out into the backyard. I noticed movement and there was a big but young buck (only two points per antler). I ran and got the camera and managed to snap him in the neighbour's yard. I went back in, looked up, and there was the doe just walking out of our yard. Too late for a photo. I went back to typing, figuring I'd seen a courting pair come and go. But then I saw movement again. Two youngsters, not quite fawns--no spots--but not grown up either. They were nosing around looking for windfalls. I snuck out and managed to get that shot before they moved away, seeing me. I shook down some more and was pleased to see the two fawns out there again later in the afternoon. But this time I didn't try to take their picture, and let them munch in peace. It's actually not for another two weeks. Ooo, Berkeley Plantation looks great, Fordflappers. I have only been down in the Tidewater area decades ago, and knew nothing of this historic home. I love visiting such places. I've still only seen fewer than a half-dozen in the northern VA area. My favourites were Gunston Hall (George Mason's house, I believe), and Mt. Vernon for its grounds and view. Your yard is full of magic! Have a lovely meal together, Shirebound. I'm the hostess here, as usual, but nothing overwhelming. Besides me, my husband, and our daughter, there will be his mom and dad and brother, and one of my best and oldest friends who is a professor in a college south of the Twin Cities. I hope I manage to serve the meal on time this year. I'm always running late, no matter how many lists I make or prep I do ahead. Cool! Deer in your yard. I have heard they can eat a lot in a yard, and I guess that's a nuisance, but with snow on the ground, they've got to eat something! You are doing them a great service not having a wall. I think we had so much damage last winter because we had a bird feeder. They girdled and killed the neighbour's apple tree, and they nearly killed our huge old Burning Bush so that we had to chop its ten feet of glory down to the ground to revive it. It's not so bad when they crop the ends of things. That stuff can grow back. Last winter, ee found that we had very, very few birds coming to the feeder for the longest time. Finally we were going great guns, with empty feeders every morning. But one night in the early hours I got up to go to the toilet and saw movement through the picture window in the living room. I squinted, seeing a large shape moving under the feeders. Was it a bear? I tiptoed off to find my glasses. No, it was not the hump of a big bear, it was three deer. I had put the feeders high enough up to be out of harm's way, I *thought*. But the deer could stretch up, even stand on their hind legs like circus ponies. With their noses they'd tip the feeders at an angle so that the seed spilled out. They kept doing it until it was empty. One would spill while the others ate the seed off the ground. Those little pixies! That was the end of the winter bird feeding. I must have gone through twenty pounds of Wild Bird Mix feeding deer. And because they came each night for the seed, they'd got fond of the yard as a dining place and started in on the bushes. But we didn't know about that until the thaw when we went out to assess the winter damage. I do love looking at the deer, but they are the bane of gardeners when they become numerous, frequent visitors. Especially hard is seeing trees and shrubs killed. When you've selected, purchased, planted and nurtured a plant yourself for years, it's harder to see it damaged, even destroyed. I like the thought of the deer finding those fallen crab apples - it's as if they get to share in the Thanksgiving bounty, too. You're welcome, Mews. Happy Thanksgiving! Will you be hosting anything at your house or going to someone else's, or do you plan to curl up with a glass of wine and read? These deers are so beautiful, they look as if they come from a fairy tale. And a Happy Thanksgiving to you, dear. 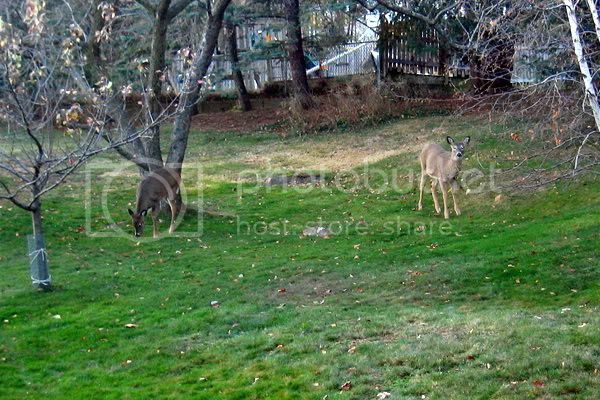 A lovely shot of the deer - and what a nice roomy backyard. Thank you, Marigold, and Happy Thanksgiving! Our backyard is bigger than it looks because the buffer between the yards actually belongs to the city. When the houses on this block were built during the 40's and 50's, the residents opted to forego the usual alley in the back. People have driveways in front going to tuck-under garages, with no alley, thus bigger back yards. Each approach has its plusses and minuses. Mostly in these neighbourhoods front yards are more village-like, with sidewalks on the street and up to the front door. Garages (separate from the house) are on the alley that runs through the middle of the block. Each approach has its plusses and minuses. I like a more private back yard, but I think blocks that have all the garages and driveways in back look much more welcoming and homey. I'll bet that's more than you wanted to know about backyards in upper Minnesota, Marigold. Shees! Shees, Hadara. I accidentally stuck my answer to the person whose comment was just above you onto yours. What I had wanted to say to *you* was, besides Happy Thanksgiving, I LOVE your "hands of a healer" icon. Did you make it? I wish still they'd done him healing Faramir in the Houses of Healing, although I thought the scene in which he cares for Eowyn there (in the EE) is very beautiful and one of my favourites in RotK. Yes, they are lovely deer. I think it's part of being young -- like you! Are you having Thanksgiving with your fiancee? Happy Thanksgiving day to you, dear!! The picture of the deers in your backyard is wonderful, I've never seen them so close and free (well, you can't actually meet deers in a town like Rome, unless you go to the zoo!). It is neat to be able to see deer in the yard, but they sure do play havoc on gardens. In the nice weather they like to eat the flowers, especially the buds just ready to open, but also the leaves of some plants, chewing them down to the ground. In the winter they browse the bushes and young trees. Naughty things, but so pretty. You may not want them in Rome, except confined to a deer park, like they did at Oxford. Oh how lovely! I always feel really blessed when I see deer, even when they're just munching by the roadside. I guess I wouldn't feel so blessed if it were my garden they were munching, however. I agree, seeing the bucks is extra cool because of their flashy antlers. But three at one time! Lucky you to have seen them. The cats are nature-Philistines. You had four hours of snow? Enough to make a snowman???? Awesome! It's really snowing here right now for the first time, but we're only supposed to get an inch. There are so many people travelling at this holiday, though, I suppose that's better. They are so beautiful, and what a pleasure it must be to observe them so closely, in you own garden! I hope they left some apples for another day. Well, there are some apples out of reach, out of my reach, too (I shook the rest down with a rake), but they'll fall eventually during the winter. Guess what? Today we had guests for Thanksgiving dinner and when I was in the kitchen they were all yelling, look, look! It was a buck right outside the living room window eating the bird seed I'd put down for the animals in honour of the day. It was broad day light, but he wasn't frightened a bit. He only got nervous and sauntered off when a car passing stopped in front of our house, apparently to look at the deer.